What is purpose driven math? 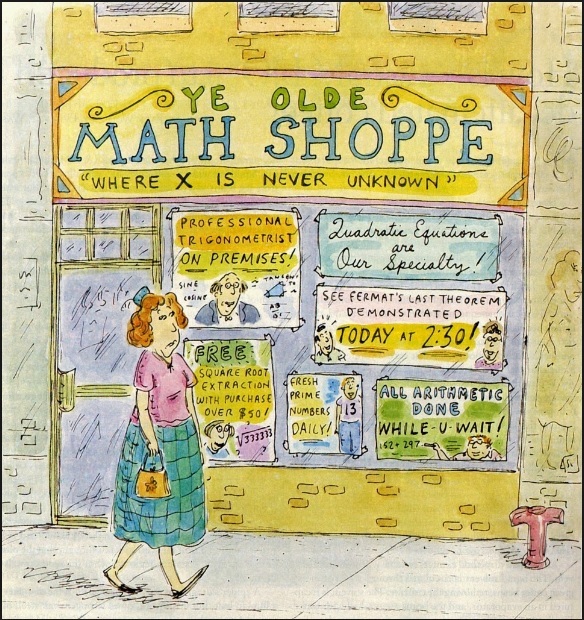 The following is an adorable math cartoon that I found recently. It turns out a daily supply of fresh prime numbers is not just something only mathematicians care about. Internet commerce depends on a daily fresh supply of prime numbers. In fact, a fresh daily supply of prime numbers that are several hundred or even thousands digits long. Whenever you enter a credit card number on the Internet, it would be very risky for you if the credit card number is sent over the Internet without masking (encryption). Then other people can read it and make use of it without your authorization. It would be like shouting secrets in a crowded room. Before it is sent, the credit card number is encrypted. Once it gets to the destination (the online merchant), the credit card number is decrypted. One of the most commonly used encryption/decryption schemes is the RSA algorithm, which is built on prime numbers. Every time a piece of sensitive information, e.g. your credit card number, is sent over the internet, the RSA algorithm encrypts the information using a public key, which consists of a large number that is a product of two large prime numbers and (note that the two prime numbers and are not known to the public, and that only is). Once the encrypted information arrives at the merchant, it is decrypted using a private key, which consists of the two individual prime numbers and . The security of the RSA algorithm rests on the difficulty of uncovering and if only the product is known. To get a better sense of how RSA works, see this article from Slate. See here for another introduction to RSA algorithm. For RSA algorithm to work properly and securely, a fresh daily supply of prime numbers is necessary. What is purpose driven math? Due to its wide spread use in online commerce, the study of prime numbers would be called purpose driven math. It is interesting to point out that prime numbers were not always regarded as purpose driven math. Euclid proved that there are infinite number of prime numbers (circa 300 BC). Prime numbers had a special hold on humanity ever since, even though they were studied more in a “math for math’s sake” kind of way. Many people through the ages found prime numbers interesting and important, but never as a way to enable commerce. It is not always easy to tell ahead of time whether a given mathematical construct is purpose driven math. Thus what is considered esoteric math today may become purpose driven math tomorrow. There are actually many other mathematical theories and notions that were not meant to be purpose driven at the beginning but were found to be useful later. Some people disdain (or at least do not value) mathematical theories that have no practical purpose. I have a friend who always ask “what is the use of this?” whenever I mention a math concept in a conversation. There are mathematicians who disdain mathematics that have a practical purpose. The notion of prime numbers is a bridge between these two extreme camps. As an abstract mathematical theory, prime numbers are beautiful and interesting. On the other hand, prime numbers make it possible to transmit sensitive information. In this blog, I will discuss bridge concepts such as prime numbers and other purpose driven math. This blog is a small attempt to dispel the notion that math is useless or meaningless. I hope that learning purpose driven math will be an antidote to math phobia or even math hatred. I have no illusion that the blog will be a cure all for math phobia. I hope that some readers will come away with a sense that there is more to math than the math taught at school. There is purpose driven math and there is school math. For many, school math is fear and anxiety inducing. Many students do not like math but have to endure it because schools require it. This blog is to show that there is another face of math. I hope that those who hate school math will hate math less (or tolerate more of it) after knowing more about purpose driven math through this blog or other resources. School math is required in order to get through school. But school math also gives the necessary background to understand and use purpose driven math. For example, to learn how money grows in a bank account, we need a tool that measures a growth phenomenon that doubles over a certain period of time (e.g. at 10% annual interest rate, the money doubles approximately every 7 years). This is called exponential growth and the tool for measuring this type of growth phenomenon is called the exponential function, which is taught in high school. Whenever a teacher mentions anyone of these terms or phrases – solving for x, the slope of a line, quadratic equations, solving an inequality, fractions and sines and cosines and many more – some students are immediate turned off. I realize that sometimes the way math is taught at school is not very effective. Purpose driven math is another side of math that is often omitted when school math is taught. Math is not only useful, it is one of the ways through which we make sense of the world. Thus mathematics is on par with other worthy endeavors such as science, literature, philosophy, art and music.